Former Manchester United manager Jose Mourinho is reportedly unsure about accepting an offer to become Real Madrid boss for the second time. The Portuguese tactician has been approached by the Spanish giants via his agent Jorge Mendes today, according to AS, but it seems he’ll need some persuading to come back to the Bernabeu. Mourinho was at Real Madrid between 2010 and 2013 and his time there ended under something of a cloud, as have his subsequent spells at Chelsea and Manchester United. According to AS, however, it is his previous problems at Madrid that could prevent him from returning to the job, as he would inherit a dressing room full of players he fell out with. The likes of Sergio Ramos, Luka Modric, Karim Benzema and Marcelo were at Real when Mourinho was in charge and are still there now, and it seems AS believe Mourinho would not be too keen on working with them again. 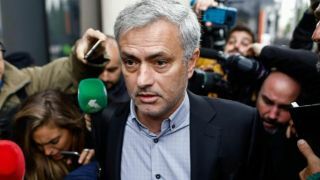 It certainly seems like a bit of a gamble to go for Mourinho after his patchy recent record, but in fairness, the Spanish giants are now pretty desperate after a nightmare season under current manager Santiago Solari and his predecessor Julen Lopetegui.